Since 2006 the Mount Michael robotics teams have had great success in local, regional, national, and international competitions. Robotics promotes thinking and collaborative skills, which are essential in preparing today’s students to become tomorrow’s scientists and engineers. This is accomplished through a combination of classroom academic preparations and in the field competition. Mount Michael robotics teams meet for 3 hours per week planning, designing, programming and constructing their machines. 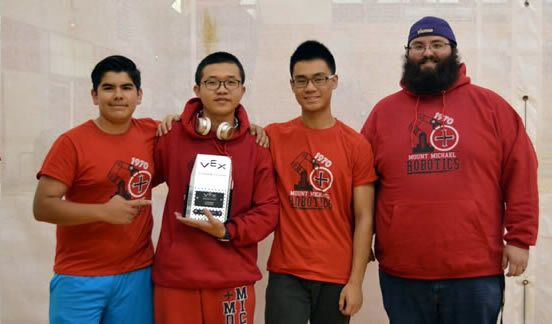 The Robotics Team went 10-0 in the qualification matches and finished first place in their division! 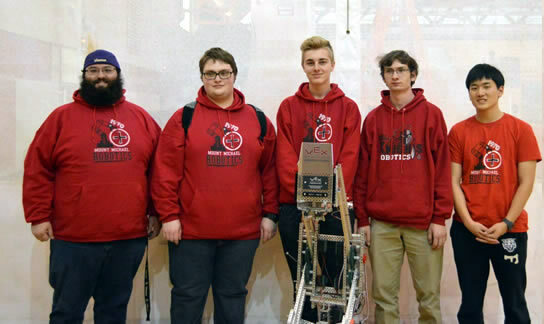 They were one of just seven (out of 564 teams worldwide) to go undefeated through the qualification matches. 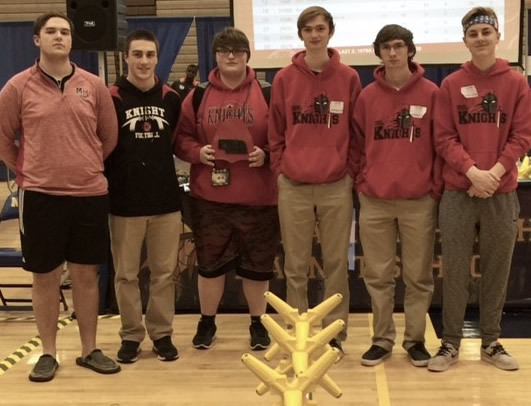 As one of the top eight teams, Mount Michael and their alliance partners advanced to the elimination matches and were not beaten until quarterfinals. From Left to Right: Coach Michael Williams, Lukas Williams, Nolan Gottsch, Nolan Huetter, Hanool (Jeff) Kim.